A contemporary reimagining of the lunch canteen serves up a treat for tech-savvy food lovers. 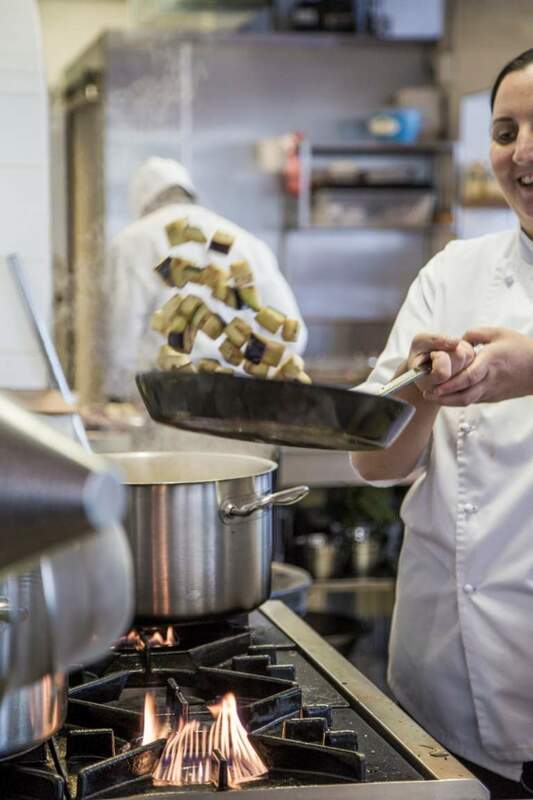 Once you’ve eaten at this forward-thinking, still-new Gardens eatery, I challenge you not to keep checking their website for the day’s menu, even on days when you know you’ll be eating at your desk. The food is that good, and even with just three dishes (meat, fish and plant-based) on the menu, plus one dessert, it’s surprisingly hard to choose. The answer is to go with a party of three, so you can sample the Charred aubergine and tomato terrine, the Green herb, pistachio and lime-crusted linefish and the Tartare of beef, and maybe still have room for the Buttermilk panna cotta dessert. 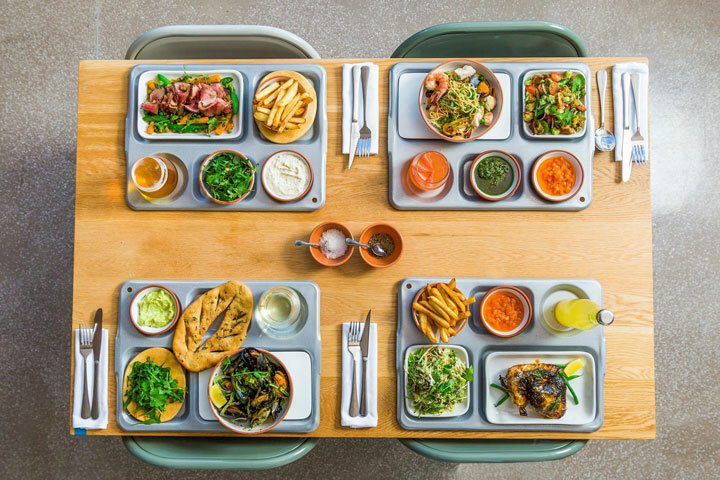 The menu changes daily, but do keep an eye out for the the flavoursome aubergine terrine served with a mustardy salad of rocket, almonds and shaved parmesan, herb chilli flatbread, parsley pesto and tomato salsa – each element sitting prettily in its own slot on a custom-made canteen tray. It’s a presentation concept ideally suited to the excellent tartare – hand-diced cubes of beef with capers, gherkins, parsley and chilli oil, with a soft egg nestling on well-dressed leafy greens, battered onion rings, wood-fired melba toast and the chef’s onion chutney. The food is thoughtful, fresh and delicious, and the experience upbeat and efficient. There’s nothing cheap and cheerful about the very compact, decidedly local and highly curated wine list, with none of the usual suspects in the line-up of three whites, three reds and a single rosé. They’re all available by the glass, which by the way means a tumbler. Prospective waiters should not call at 81 St John’s Street, as the concept all but eliminates the role of service staff. 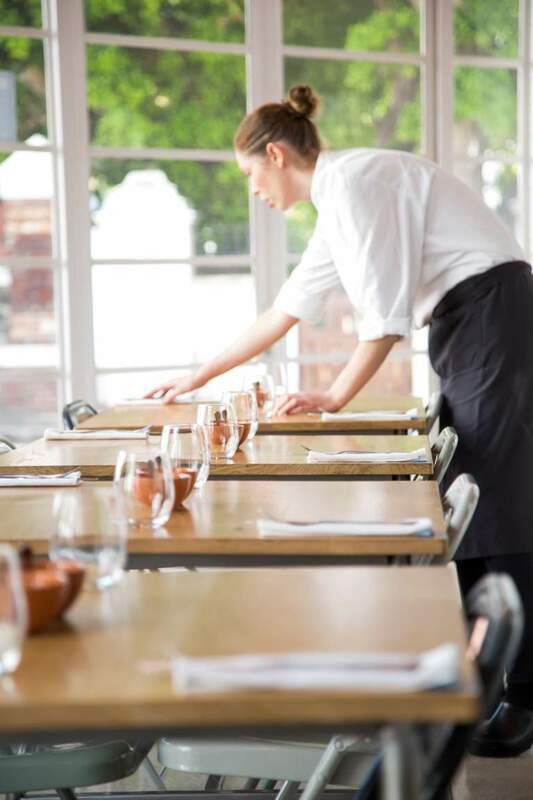 But although you’ll order your meal online, or from an iPad at your table, and pay for it before it arrives, the process is so seamless that you will consider yourself very well served. Going several steps beyond the open restaurant kitchen, the dining area at Chefs feels like an extension of the kitchen, rather than the other way around. There is zero romantic artifice. Instead, there are pristine white-tiled walls, large industrial style windows and miles of shining steel. There’s also a bit of a din that doesn’t emanate from the strikingly serene kitchen but seems to be an acoustic quirk that rules it out as a venue for intimate or illicit rendezvous. If I must choose to have good food in a basic venue, or average food in an upmarket, plush and romantic one, the former, in my book, is by far the best option. A no brainer. Spending too much on decor and venue makes the food too expensive, plain and simple. Then, in order to survive, the owners either cut corners and the food becomes average, or the prices go through the roof. Chefs represent the first option. A basic venue with almost no decor but who cares if the food is as good as what is served at Chefs. Well priced too because the owners are not chasing turnover to pay off the construction debt. A short menu, short wine list, no waiters and the service is quick and spot-on and done by the chefs themselves. Three of us had the saucy, tender sirloin which was great and my wife went for the plant option that was (for a change) interesting and tasteful. The wine list was short but good and complimented the food. We will definitely be back. 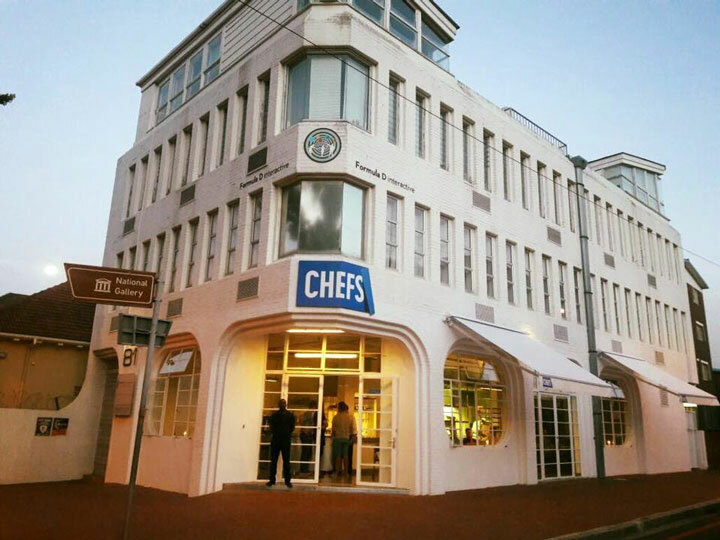 My absolute favorite in Cape Town for delicious, wholesome, innovative delicious meals. Outstanding new eating concept. Beautifully prepared in the clay oven with outstandingly fresh, innovative and yummy salads. Always a delight!! Love you guys!! Loved the style of the food served in a cafeteria tray and it tasted phenomenal. Menu changes each day so check website on the day. Atmosphere had been a bit cold.